HTML is short for HyperText Markup Language. It is a document format primarily used for web sites on the internet. PDF is short for Portable Document Format. It was created by Adobe systems and is also popular on the internet. It is optimal for scanning and printing due to usability concerning page sizing. PDF, however, requires additional computing resources and bandwidth compared to HTML. PDF is not always supported, especially among mobile platforms. HTML documents may change depending on the browser used or browser version. Other hardware and software conflicts may affect the finished result. An HTML document by itself, usually, does not have all the required files to provide the intended experience. There will usually be pictures or additional fonts needed that cannot be included within the HTML document. In contrast, PDF files contain all the formatting, pictures and fonts within the document itself. Thus, viewing a PDF is a more straightforward and provides consistent results when it is available. HTML tools is a command-software which runs in a DOS window. Command line offers the user greater speed and control. Lacking a GUI, the software takes up minimal system resources. Using command line options, commands can be executed for the specific task needed. It is a .zip file of 6,502,796 bytes. Zip is a data compression format. HTML Tools is compressed to conserve disk space and bandwidth. Upon extracting, multiple files and folders are created in a /htmltools/ directory. Open either the readme.txt or verypdf.rtf files to view instructions for the program. A full set of program commands are provided. Press the windows key or click on the start button at the bottom left of the Windows screen. Type “cmd” and cmd.exe should appear. Right click it with the mouse and the options “Open” and “Run as administrator” should appear. 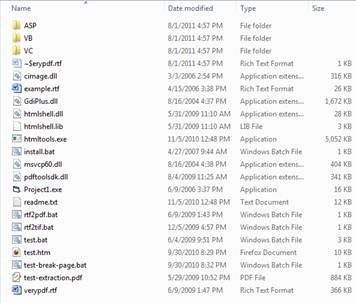 The cmd.exe file, by default, appears in Windows\System32\. It can also be opened by going directly to that directly via Windows Explorer or My Computer. After opening the program, the command prompt will appear. It can be used to navigate between directories. To change to different disk drives, simply type “X:” where X corresponds to the drive letter. Press enter and the program will run according to the options specified. In this example, the input.html file in the C:\htmltools\ directory is converted to .pdf format. The converted file is named output.pdf. For further examples, the readme.txt contains a sample list. For ease of use and organization, we recommend creating two new file directories. Create one for files that require converting and one as a destination directory. For purposes of this example, we are using C:\html\ as our input directory and C:\pdf\ as our output directory. To follow along with the example, put all .html files that require conversion into a C:\html\ directory. Create a C:\pdf\ directory. This command would result in the conversion of all .html files inside the C:\html\ folder into .pdf files. C:\pdf\ is the destination folder. 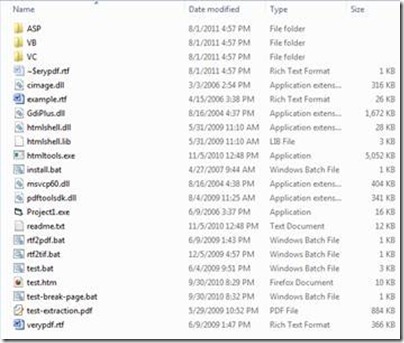 How to call htmltools.exe from IIS7.5? How to show detailed log message in IIS 7.5? How to set execute permission in IIS 7.5? How to rotate the page while converting wmf to gif? This entry was posted in HTML Converter (htmltools) and tagged HTML to PDF, htmltools. Bookmark the permalink.